May 7 is almost here, and the class of 2016 couldn't be more excited or more nostalgic. As a tribute to their time spent in SOC learning, growing and experiencing new challenges, SOC seniors reflect on their time at American University and how it has prepared them for life beyond graduation. 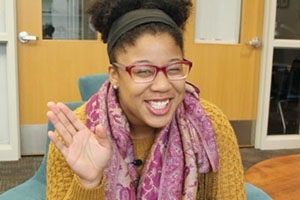 Vashti Harris on taking Understanding Media (introductory communication class): "We had all these different mixtures of people, and my professor was really into letting us speak our opinion and our minds. It was a good foundation for what was to come next." Danny Dubin on SOC courses: Whether it's when to use a comma in your writing in AP style, or overall how to draft a certain memo, I think each class has really given me something useful for the future. Dyáni Brown on the SOC professors: There are so many brilliant professors here that are just phenomenal to study under! Alex Kreinces on the SOC connection: Between the students and the professors, everyone here is so willing to help each other find jobs or internships.